We provide services in Greater Toronto Area (GTA) also stretching to Niagara Falls-Barrie-Pickering (to book an Estimate, visit our Web Store). - home decor & design - making sure that your home looks elegant, outstanding, practical and welcoming. We offer Estimates for services (including Consulting). The Estimate Fee is $60.00 and will be credited towards the Sale Price if Order is made. 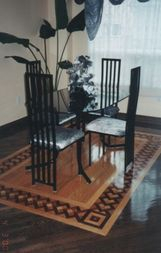 We offer professional Prefinished Hardwood Floor Installation (also Laminate, Engineering, Parquet). We offer professional Unfinished Hardwood Floor Installation and Finishing (stain and varnish). 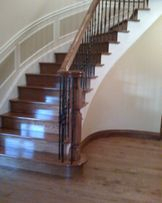 We offer professional Hardwood Stairs Installation and Service. "The best team in Town, pleasant installers performing greatest work." "We renovated home before putting on the market to sell, and we didn't even think that hardwood floor can look so amazing, the value of the house went up." "The best experience ever, changing carpet stairs to a hardwood stairs, adding new fancy pickets and matching railing - now my house looks like "million dollars show home" the stairs and hardwood floor made a such an amazing difference, and most of all the work was done within few days by such a talented team. - Sophia & John F.